These are the three most prominent peaks in the Long's Peak Massif. 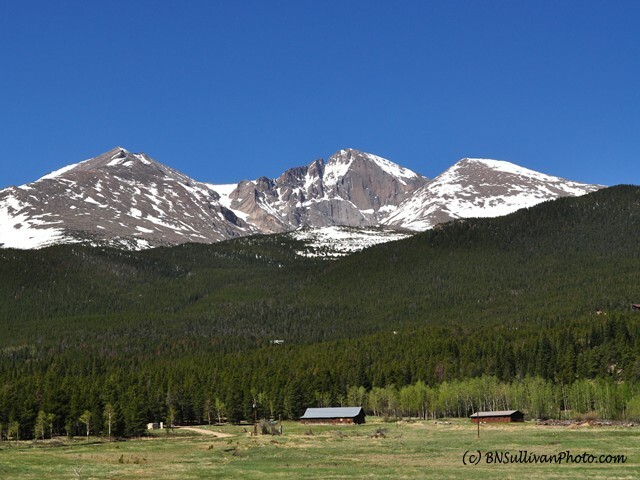 From left to right, Mount Meeker, elevation 13,911 feet (4,240 meters); Long's Peak, elevation 14,255 feet (4,345 meters); and Mount Lady Washington 13,281 feet (4,048meters). These mountains form a part of Colorado's Front Range. This view of the Long's Peak Massif was photographed from an overlook on Colorado Highway 7, just north of Meeker Park. That stretch of of Route 7 is a part of the Peak to Peak Scenic Byway, a system of roads traversing the foothills of the Front Range from Estes Park in the north, to Interstate 70 in the south. What a wonderful view! Just beautiful and so majestic.